C.-P. Wirth, J. Siekman, M. Gabbay, D. Gabbay, eds. 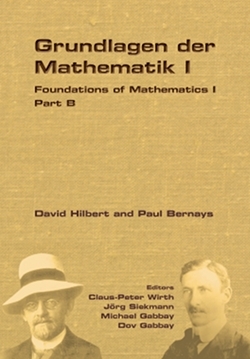 Hilbert and Bernays’ "Grundlagen der Mathematik" appeared in two volumes in 1934 and 1939, a second edition in 1968 and 1970. It offers a foundation for proof theory and is a major source on David Hilbert’s formalist programme, Paul Bernays’ philosophy, the epsilon operator, and much more. It has been a profound influence on mathematics, logic, and philosophy, and it covers formal ground and philosophical perspectives beyond the scope of Whitehead and Russell’s "Principia Mathematica" and Frege’s " Grundlagen der Arithmetik".